We’ve received two letters in response to our Aug. 2 Home Truths column about renewal fees, both from landlords who obviously want to relate, as Paul Harvey used to put it, the rest of the story. Both letters were sent to the Japan Times, one for the Readers in Council page and the other indirectly to us with a directive that it not be published. Moreover, the RIC letter was published anonymously, so while both of these persons hold strong opinions as to their own situations as property owners neither seems to feel that strong that they might risk exposing themselves to whatever sort of negative reaction landlords can normally expect. This is probably unavoidable. The landlord-tenant relationship is almost by definition an adversarial one; the dynamic fraught with defensiveness. Both landlords basically wanted to show the difficulties of maintaining properties for rental purposes in Japan, and in the process defended the collection of supplemental fees such as reikin (gift money), shikikin (deposits), and koshinryo (rental agreement renewal fees) as essential to their businesses. In both cases, however, the letter writers missed the point of the column, which was not to argue that landlords do not have a right to make a profit, but rather that the supplementary fees, in particular renewal fees, are arbitrary and not transparent enough. One of the letter writers focused on gift money, which is the least opaque of the three since a tenant has to pay it before he moves in. He said that he needs this money to pay for repairs over time, which can be very expensive. Our rejoinder was to ask: Why not simply charge a monthly rent that allows him to maintain his property in a proper way? Why does he have to accumulate a reikin “fund” for such repairs, which, after all, are his responsibility? The rental contract, at least in most countries, implies that the tenant pays a certain amount of money for the privilege of living in a dwelling that is owned and maintained by the owner. If the owner is not making enough money from the rent to pay for that maintenance, then he either isn’t charging enough or there is something seriously wrong with the housing market. In this case, it’s probably the latter. As we stated in the column, vacancies are on the rise and will continue to rise. It will become more and more difficult for landlords to collect steady incomes from their properties, and therefore they probably feel justified in collecting supplemental fees because those fees can make up for income they lose due to empty units. But that doesn’t make it any less arbitrary. The other landlord, the one whose letter appeared in the Japan Times, seemed to feel that the occasional dishonest tenant, the one every landlord fears, justifies the charging of fees to all the honest ones because that’s the only way he can ensure income. He told a dramatic story about a tenant who stopped paying rent. The lost income and legal fees to have him evicted ended up costing the landlord more money than what he had collected from the tenant. Consequently, people should understand why they pay such supplemental fees. We imagine most tenants will react even more strongly against his interests, since he’s implying that all tenants are potential scofflaws and so they should pay these fees before trouble even has a chance to rear its ugly head. There’s nothing much to add to this story except that landlords obviously have it tough and will probably have it even tougher in the future. But that doesn’t make supplemental fees justifiable. There are no laws regulating them, so if landlords want to impose them they can, and in any form or amount they want to. In that regard, any sort of defense of the practice can’t help but come across as self-pity. Interesting. I live in Sendai, where reikin has largely disappeared, but am in Osaka this week. Walking around, I like to look at estate agent windows. It seems that reikin is alive and well here in Kansai. As we said in our column, supplemental fees are mostly regional things. 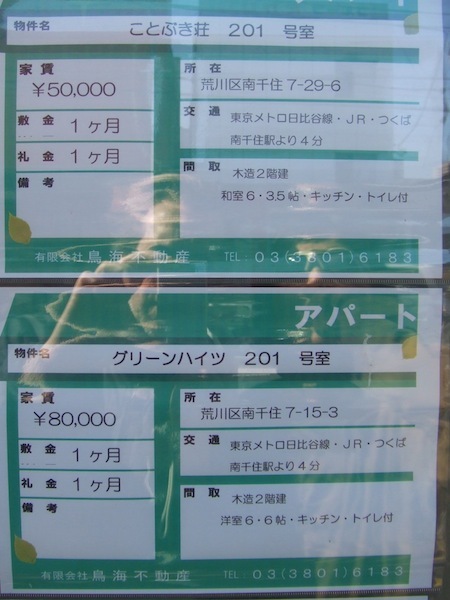 Renewal fees, for instance, tend to be limited to Kanto and Kyoto. But you’re right. As the number of vacant units increases, potential tenants will gravitate toward those that don’t charge them. Not sure to understand why reikin should be a problem. Why is an upfront payment (reikin) or a renewal fee not transparent? As long as the amounts are clearly stipulated in the contract, there is no abuse and the issue is purely an economic one (defining what is a market price and the relative economic power of landlord and tenants). Asking the tenant to pay a large amount upfront is a form of guarantee against bad payers. This makes sense since for traditional leases the law is clearly in favor of the tenants. Again, just because reikin and renewal fees are stipulated in contracts doesn’t make them transparent. Deposits (shikikin) are understood to be “security” against failure to pay rent, though many landlords in Japan withhold them for “cleaning.” The purposes of reikin and renewal fees are not clear, and despite the “reasons” we’ve heard from landlords in response to our column, it’s never been explained why these fees, if they in fact are supposed to be used as some sort of “security,” aren’t simply incorporated into the rent itself. And the fact that many landlords don’t charge reikin and renewal fees proves that they aren’t necessary. I assume from your response that “transparent” is supposed to mean “justified” but legally speaking this is not a requirement (to the difference of common law countries). I can ask you to pay me something and as long as you have agreed, the agreement stands, whether the payment makes any sense or not. I do not understand why increasing the rent by a corresponding amount would make things more transparent: there are many different ways to pay for a service. The fact that some landlords do not charge a reikin is irrelevant too. Again there is a freedom to contract, some landlords may prefer a higher monthly rent, others may prefer an upfront payment. As long as landlords have the economic power to impose their conditions, they will. Arguing that the payments are not transparent or unjustified completely miss the point. Legally speaking, you are exactly right, which is the whole point. The landlord is allowed to charge whatever he wants and does not have to give a reason. Consumers, however, have a right and a responsibility to question what it is they are paying for, and if I as a potential tenant were told to pay a non-returnable fee up front as security for possible unpaid rent *in addition* to a security deposit, I would ask, Why is this necessary? If the landlord asked for, say, three months *refundable* security deposit for the same reason, I wouldn’t question that (this seems to be the practice in Kyoto). Just because the law allows the landlord to charge any arbitrary fees he wants doesn’t make it right. If you need that money, just incorporate it into the rent, because then the tenant understands what he is paying for. I agree that we renters have a right to know what it is that we are paying for. As a lifelong renter, I’ve always detested the feeling of being at the mercy of the whims and dictates of the owner, and never knowing what fees or conditions s/he is going to slap on next. It really does seem arbitrary at times. In the case of a one-room apartment that I rented, I was asked to pay a “cleaning fee” of 60,000 yen upon moving in, and another one upon moving out. Let me tell you that NO professional cleaning took place in that apartment – I did it all myself, white gloves and all, as did the previous/subsequent renters. The landlord pretty much gambled on our willingness to be polite and not look like slobs, and fortunately he got lucky. On the other hand, the rent itself was relatively cheap. If it had been advertised at 10,000 yen higher, I probably wouldn’t have looked at it twice. So considering that I only lived there for one year, it all worked out evenly. It would’ve worked out much cheaper the longer I stayed there. I completely understand about the need for transparency and knowing exactly what these fees are for. I have to say when it comes to renting I miss Australian laws. The bond (usually 2 to4 weeks rent) is actually held by a government body. There are no “cleaning fees” as it is clean when you move in and when you move out it is expected that it will be in the same state. The landlord can only charge if there has been damage beyond usual wear and tear or the person was a pig and didn’t clean it up. Basically when both sides are happy a release is signed and the renter gets there bond back – all of it. Here they charge for all kinds of crap with little explanation which makes you less than secure about fronting up huge fees so you can pay rent. Even worse is the gift money to the agent! What is that for? The gift money goes to the landlord. But, yes, the realtor takes their own pound of flesh. There’s something for everyone. Japan has relatively high rental yields, so landlords don’t have a strong argument that key money and renewal fees are necessary to help with running costs or loss of income. If they have invested well, the typical net rental return on an occupied apartment should leave them with plenty of cash in their pockets. The extra fees have been around for decades and tenants have dutifully paid them with no complaints in the past, so there was no impetus for landlords to stop charging until recently.